--- Last One Gets Gems "[Crystal added!] Enhance DX+ Pack" campaign! To Winner (last purchaser) of the "Last One Get Gems" campaign. 100 Gems had been transfered, so please log into the game and check that transaction had made properly. Last One Gets Gems in "Enhance DX+ Pack" campaign will be held! "100 Gems" will be gifted to the Player who buys the last remaining one! *Gem gifts are scheduled in the next business day. *The winner will receive their items being transfered. * Chances to win "Upper avatars" and "Shining avatars" will be doubled. --- All Weapon Avatars! "Premium Weapon Avatar Pack" now on sale! 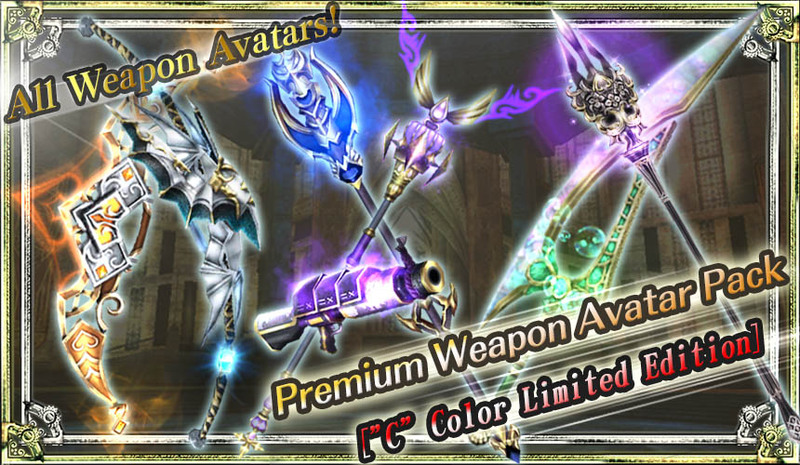 The "Premium Weapon Avatar Pack (C colors)" with all weapon avatars inside will be on sale. Only the "Weapon Avatars" of the following avatars will be won. * Colors will be only "Original Colors (C colors)". --- "Evo liquid Jackpot Pack" now on sale! A big chance to win 10 "Evo liquid"s! The "Evo liquid Jackpot Pack" will be added to the Shop lineups!